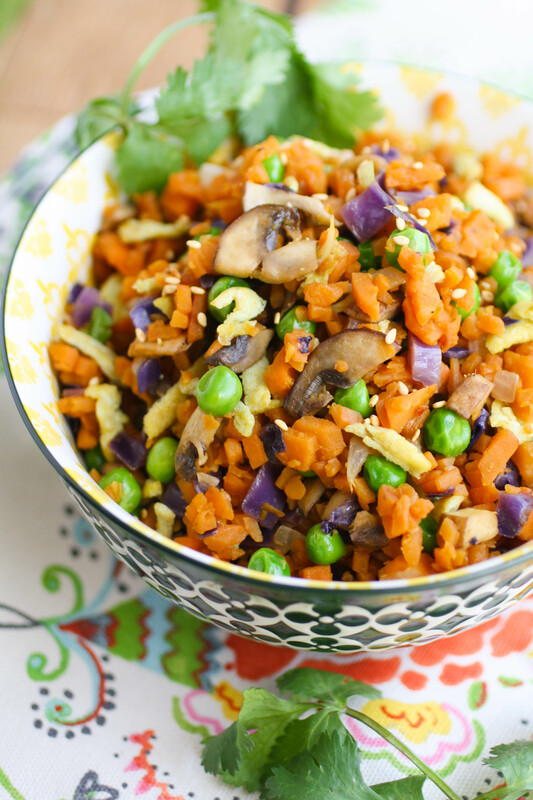 Sweet Potato “Fried Rice” is a fun twist to a traditional dish. You’ll find it hearty and colorful, and perfect as a side or main dish. You decide! What do you do with a bunch of leftover sweet potato pieces and parts? That might sound strange, but when I made Sweet Potato Carbonara recently, I spiraled up some sweet potato strands and was left with a bunch of useable remains (think about that long, skinny piece left behind in the machine after you spiral slice something, and the ends of the potatoes, too). Who wants to toss perfectly good food? Not me! So I scooped up the scraps, popped them into a bag, and tossed them in the freezer to use on another day. You could use the scraps to make my Curried Sweet Potato-Spinach Egg Muffin Cups (such a great grab-and-go meal option), or Sweet Potato & Black-Eyed Pea Curry. Am I the only one who wonders if fried rice is supposed to be a side dish, or a main dish? Please tell me I’m not alone? Either way, this dish works. 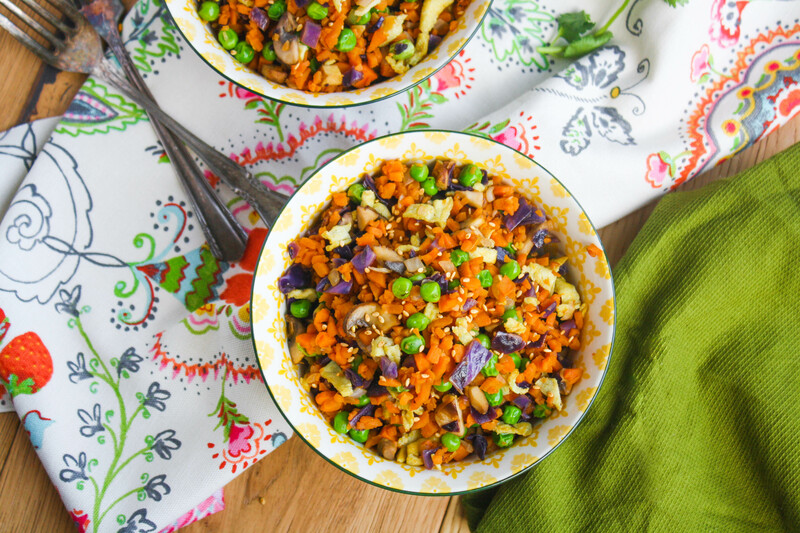 Sweet Potato “Fried Rice” is super filling as a meatless main dish, but you could serve it as a fabulous side, too. You do you! I ate this up as soon as I made it (I couldn’t wait for actual mealtime), so I’m not sure what that’s considered. Clearly I considered it delicious because I couldn’t resist several big spoonfuls. Add your favorite veggies or even your favorite meat to the mix. I kept this vegetarian to serve as a Meatless Monday dish, and tossed in purple cabbage, mushrooms, onions, and peas along with a handful of seasonings. Whatever you do, don’t ditch those pieces and parts! Instead, turn them into a perfectly tasty and easy-to-make dish like Sweet Potato “Fried Rice.” You’ll be glad you did! Add the egg to a small bowl and whisk. Add about 2 tablespoons of water to the egg, and whisk again. Add a small skillet to the stovetop over medium heat. When hot, add 1 tablespoon of the sesame oil. When hot, add the egg mixture and let it spread flat like a thin pancake. Cook for a few minutes, then flip. After a minute or so, remove from the heat and transfer the egg to a cutting board. Cut the egg into small pieces and set aside. Add a large skillet to the stovetop over medium heat. When hot, add the vegetable oil and the remaining tablespoon of the sesame oil. When hot, add the onion and cook for a few minutes, or until it begins to soften. Add the garlic and ginger and cook for 90 seconds or so. Add the remaining sesame oil to the skillet. When hot, add the sweet potato and cabbage. Add the salt and pepper. Stirring, cook for several minutes. Add the mushrooms and cook for several more minutes, stirring occasionally. Add the peas, soy sauce, and the egg pieces to the mixture, and toss to combine. When the peas have warmed through, remove the skillet from the heat. Definitely easy to make, Alexis! Hope you try it and enjoy! I already pinned this because it looks chalk full of awesome things and like it would taste amazing. Can't wait to try! Glad to hear it - thanks so much, Sarah! Enjoy! I love this recipe and my family would too! I would call it a main side! Thanks so much, Quinn! Love the "main side" category!! This looks so delicious! 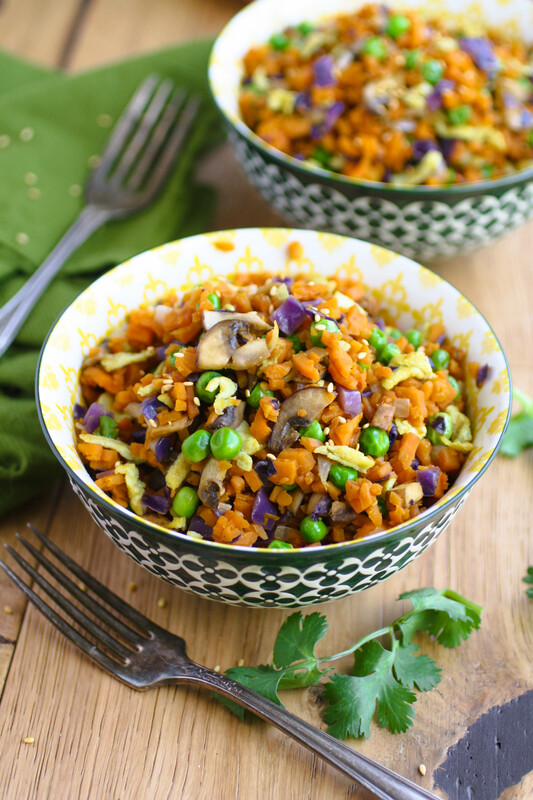 I just love sweet potatoes, and I love this clever spin on fried rice! We enjoy fried rice so will have to try out your sweet potato fried rice version. Thanks, Candy! Hope you enjoy it! This is wonderful! We hate throwing away food too. And using the "scraps" for "fried rice" is genius. I usually eat my fried rice on its own, especially if it has lots of other yummy ingredients but I won't say no to a piece of chicken lol. Hi Jolina! Thanks so much -- this is a perfectly filling dish, for sure! this looks amazing. 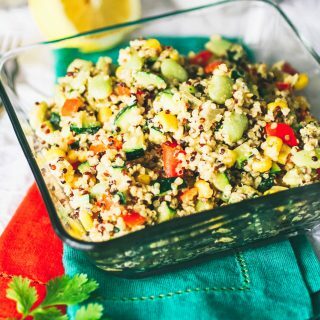 I am adding this to my meal plan this week! Yum! That's awesome, Kristen! I hope you like it! Love this twist to traditional fried rice! Can't wait to give it a try! Thanks, Jessica! I hope you like it! I have never thought to prepare sweet potatoes like rice but I love the idea. I can't wait to test this recipe out. Thanks a bunch, Cori! I hope you try it soon, and enjoy! My mouth is watering looking at this--mmm yum! I cannot wait to try this fried rice recipe! Thanks, dear! I hope you love it! Wow Patricia! That sounds really great! I love sweet potatoes and they are so healthy too! 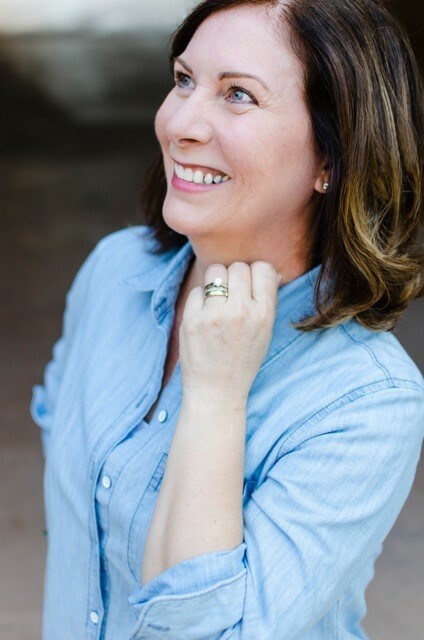 Thank you, Cynthia! I loooove sweet potatoes, for sure! Shut the front door! I need to make this ASAP. This looks so incredibly yummy and I love that there is a healthier alternative to one of my fave dishes! Try it! Try it! I hope you love it! Thanks, Cara! This looks so delicious! I cant wait to try this. Thanks very much, Sue Tanya! I hope you like it! Yum!! Such a great alternative to fried rice! I just love the flavors and colors in this beautiful dish! Thanks so much, Jamie! I hope you love it like we did in our house! This looks so delicious-as a main dish or as a side. Delicious! Thank you, thank you, Kate! This looks amazing, and i can't believe this isn't a thing already! 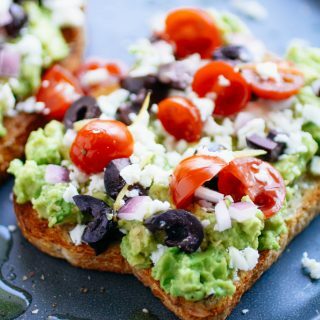 This recipe looks yummy and simple to make. My daughter loves sweet potatoes, I'll have to give this a try! Your pics of the dish are beautiful. Thanks very much for your kind words! This is definitely easy to make! I hope you and your daughter love it like I do! Thanks so much, Sofia! I hope you love it! Wow, that sounds extremely amazing! 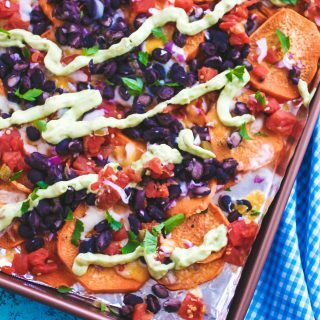 Thank you so much for sharing this recipe -- I am going to have to share it with my husband who loves sweet potatoes. Thanks so much! I hope he loves it - you can add so many different veggies to the mix, too! Thanks, Nicole! I hope you love it! 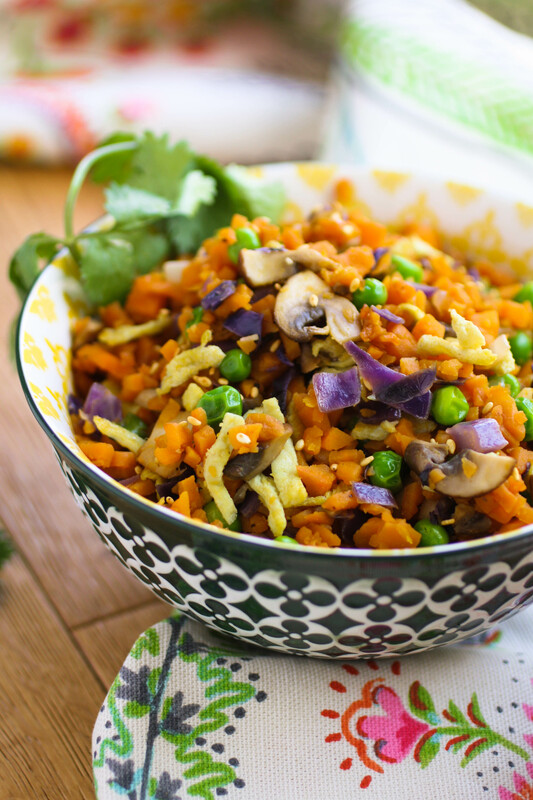 This is a great twist on fried rice and so much healthier, too! I would never have thought to use sweet potatoes, but it makes a ton of sense. Now my mind is racing with all the veggies that can be added to it. Sounds wonderful! We'll definitely have to make this. Hi Kimberly! I know - not sure why I hadn't thought of it sooner since I looooove sweet potatoes! Thanks so much for stopping by!